The Holidays have snuck up on us like a speeding train and if all things go as planned, our mountain valley is about to be inundated with visitors, hoping to make some memories built up around a white Christmas and with days filled with the joys of winter sport. As locals know, this means busy slopes and long lift lines. Those who have skied for some time are not so strongly lured to the mountain scene during this fracas, and have long undertaken a voluntary blackout to avoid the fray. The less harried past-time of Nordic skiing has provided opportunity to get out and enjoy winter’s delights without long waits in line and fighting for space on icy, over-used trails of white amongst a throng of speeding revelers. The hope of a freshening of our snowpack last Wednesday was met meagerly when a brief blizzard of a storm blew in but fizzled, leaving us only an inch or two of new. Temperatures later in the week have been pleasant, but the sun’s intensity has been strong enough to sear south-facing snow into a light crust. Powdery snow is still abundant on flatter and north-facing aspects, but the aging snowpack is becoming more granular and sugary in a way that is not so sweet. Even metal-edged XC-BC skis venturing off-track are slicing through the granules to find the ground, stumps and the occasional rock below. 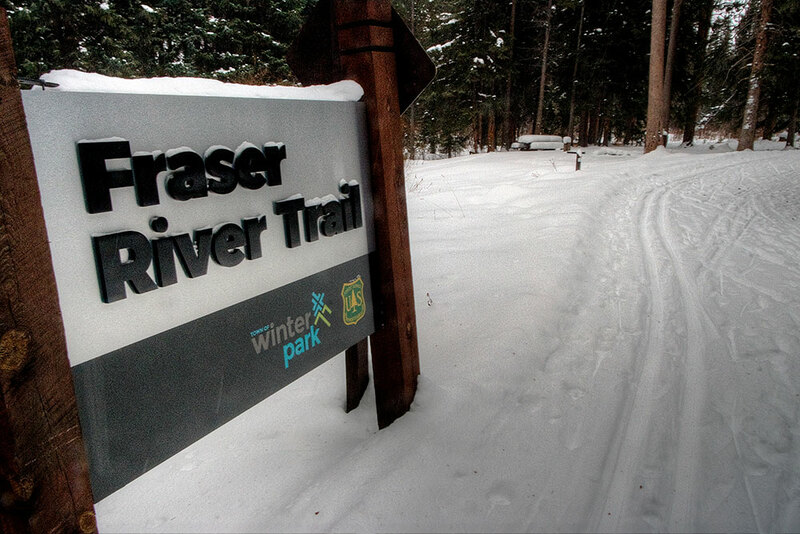 Grooming, complete with tracks has been established on the Fraser to Granby trail, Grand Park and on the south end of the Fraser River Trail. The north end of this trail from Fraser, more specifically behind Safeway to Winter Park has been a bit rougher and is skier-packed but has not recently been machine-prepped. Trails beyond the groomed are getting packed into a narrow strip by snowshoers and pedestrians. Snow-bikes are finding some of these summer biking routes adequately packed to support their wheels, but also have been turned back by a soft surface. This relatively new development of using super-fat-tired bikes over snow has begun to leave an imprint on the winter trail-scape. As this new wave of trail-users take to the winter woods, their choices may be influenced by summer riding patterns. What’s really fun in summer, however, may not be an option under Ullr’s watch. Without previous traffic to pack out the trail into a firm surface, bikes are not able to go any further than what has been previously packed or prepared adequately to support their weight. Riding on a semi-packed trail starts to become a chore, like riding on a soft sandy beach, as the snow gives way to the pressures of the tires. While being a nuisance to riders it is also a drag, if not a hazard to skiers, as bike-tire ruts later harden to deflect ski tips out from underfoot. Miles of snowmobile trails, white-ribbons, groomed and churned into a firm surface by the passage of snow machines make a more favorable riding surface, though not the summer time, narrow single track experience winter bikers would like to emulate. 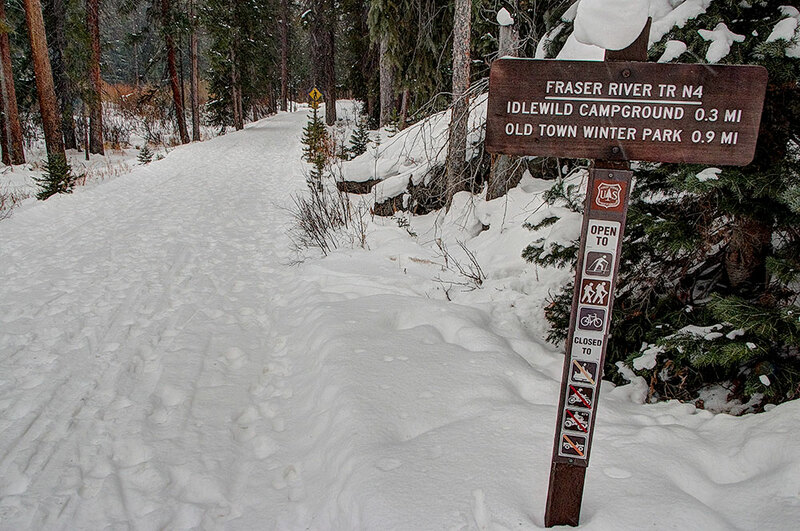 There is plenty of room for a diverse array of winter users on the trails, but a bit of courtesy and consideration for other users will make a more pleasant experience for all. Happy Trails and Happy Christmas!